I accept that as I become older, I want to see new places which was partly the reason for travelling with Qatar Airways this time. I normally go with Emirates who have been excellent and very kind to me over the years but I decided on this occasion to travel via Doha. Qatar Airways offer very reasonably priced transit tours of the city so I took one on the return journey. I was impressed that the legroom seats were available for those who checked in early and not just for the flight to Doha. My onward flight to Bangkok was confirmed in the front row also which was a nice prospect. Qatar may be a dry country but mercifully their flag carrier is not and both food and drink were especially nice as was the entire experience. Doha too has an impressive airport and whilst I chose a later departure to Bangkok to allow for any potential delays (of which there were none), the time went quickly. The delay came with the onward flight and I am happy to say that my somewhat long in the tooth thoughts about it were unfounded. When we boarded the onward aircraft, I have never seen so few travellers on a large aircraft. There could only have been 60 of us and the back cabin had just three including me. When we were told that there was a technical issue, I assumed that we would be put on the next scheduled plane. That probably didn't allow for the number of passengers hoping to travel on the turnaround flight from Bangkok but anyway, we were told to leave, sat in the lounge and tried again with a different but same aircraft type. Despite the two-hour delay, it was naturally a very pleasant flight with so few people on board. I remembered Bangkok's Suvarnabhami Airport being quite slow to leave but this time was much better. For anyone who knows me and my knowledge of mobile telephones, they may be surprised to hear that I bought a SIM card with little difficulty. Admittedly, I did tell the employee that I was completely stupid and needed it fitted, registered etc and would have been back immediately had my first call not worked. The airport bus took me to Democracy Monument from where I easily found the Paragon One Hotel where I was staying for the night. It was very nice and the room of a decent size. I may not have added to my credibility the next day, though, by helping myself to some nice looking fruit and being told that it was plastic. I only had the following morning in Bangkok before my Air Asia flight to Phnom Penh, Cambodia's capital. 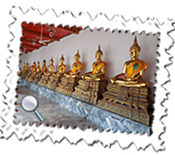 I used my time well and thoroughly enjoyed once again visiting Wat Pho, a very large Buddhist Temple also known as the Temple of the Reclining Buddha. From the entrance, it is difficult to gauge its size but certainly a good amount of time is required and I spent an hour-and-a-half admiring its many splendid buildings. I had booked a place on a minibus from the touristy Khao San Road to Bangkok's other airport, Don Muang. It worked well but Don Muang was a hive of activity and lots of noise. I could eventually chuckle when, having made it through the check-in and immigration slightly frazzled by the whole experience, I found that they put aside a "recuperation area". There was no news of our on time flight which eventually left half-an-hour late for no apparent reason but it was a short flight and was still in pretty much on time. The legroom was woeful but I was usually given an aisle seat on my flights throughout the trip after accepting the randomly-offered seats at online check-in. No, I still refuse to pay extra and be penalised for being tall. A somewhat officious-looking immigration officer surveyed my passport and e-visa on arrival with a somewhat suspicious look. As he, though, pointed out, the photo was taken seven years ago and I now have a whitish beard and don't look quite as heavenly, shall we say. "It is you! " he smiled. It was indeed and he became the first of many warm and welcoming people I met in Cambodia. The SIM card process was quite straightforward although the lady employee had to take my thumb and press it on the mobile telephone to show me how to push the + key. I wondered what on earth she and others around made of it all. A welcoming hotel taxi driver met me at the airport, oversaw this SIM card charade and took me to the Zhi Jian Hotel where an employee came running out to tell me that I had been moved to another hotel. It seems that a large Chinese group had devastated the place with cigarette smoke and I was told that I would be more comfortable a couple of doors down in the Cardamom Hotel. It was a nice thought and indeed the Cardamom - as I am sure the Zhi Jian would have been - was very nice. As with most places on this trip, I had two nights in all towns or cities but only one full day. On the main day in Phnom Penh, I enjoyed the views of the great Mekong River and saw two totally different places. 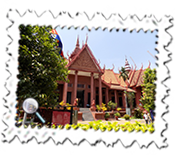 I walked to the Royal Palace and had a most enjoyable time walking around the magnificent gardens and buildings which included the Silver Pagoda. At US$10, entrance is not especially cheap by Cambodian standards but it was quite unmissable and understandably very popular. The afternoon was spent at the Tuol Sleng Genocide Museum, a reminder of the Khmer Rouge's brief but bloody reign in the late 1970s. 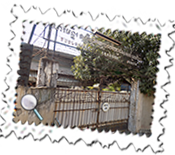 Set in a school in the heart of the city, this too attracts many visitors who are made aware of the regime's atrocities. It was quite a moving place. I did not have time to take a tour to the killing fields outside the city but the visit to Tuol Sleng was an important one. I moved on to Siem Reap by the Mekong Express. This company was very efficient and tickets could be booked online and specific seats reserved. I had booked the first row, aisle seat but due to a mix-up, was asked to move to the window seat. In the end my leg was so painful that I had to ask to move back so that I could stretch my leg and the lady sitting next to me willingly agreed. It was comfortable and a pleasant way of seeing a little more of the country and was good value at US$12 for the six-hour journey. US Dollars are readily accepted in Cambodia and it seemed bizarre changing pounds into dollars there. It took me time too but it was self-inflicted bargaining for a better rate which was ultimately agreed to. 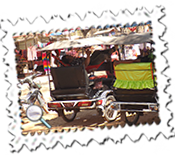 I imagined that Siem Reap would be a town which was used simply as a very convenient base for visiting Angkor Wat. It was actually a very pleasant town with a river running through and plenty of greenery. I stayed in the Kingfisher Angkor Hotel which was lovely. The staff were friendly, the breakfast was good and the room spacious and it was close to the town. 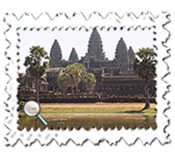 Angkor Wat is one of the main reasons which attracts tourists. And many tourists there were, I noticed, in Cambodia in general. This vast area requires transport between each temple and I, like I imagine many others started off at Angkor Wat after buying my US$37 ticket at the ticket office some way out of town and the temple area. It was a pleasant walk from the parking lot to the main temple and was very busy. There are beautiful lawns leading up to the temple from which from the best photographic opportunities arose. Walking through the complex, monks and their deities attracted crowds before visiting the main temple enclosed within the walls and, due to their height, visible from a long way off. 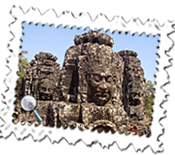 Having eventually found the driver, we went on to Bayon, another large temple but without the lengthy walk to reach it. This temple is well-known for its faces hewn from the rock and my photos almost showed the faces more spectacularly and obviously than at the time of the visit to the naked eye. 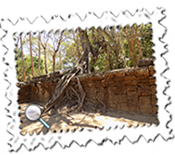 I finished up at Ta Promh which is recognisable by its Banyan-like trees around the temple. Again, there was a bit of a walk but the driver met me at the exit and so another mishap was avoided. 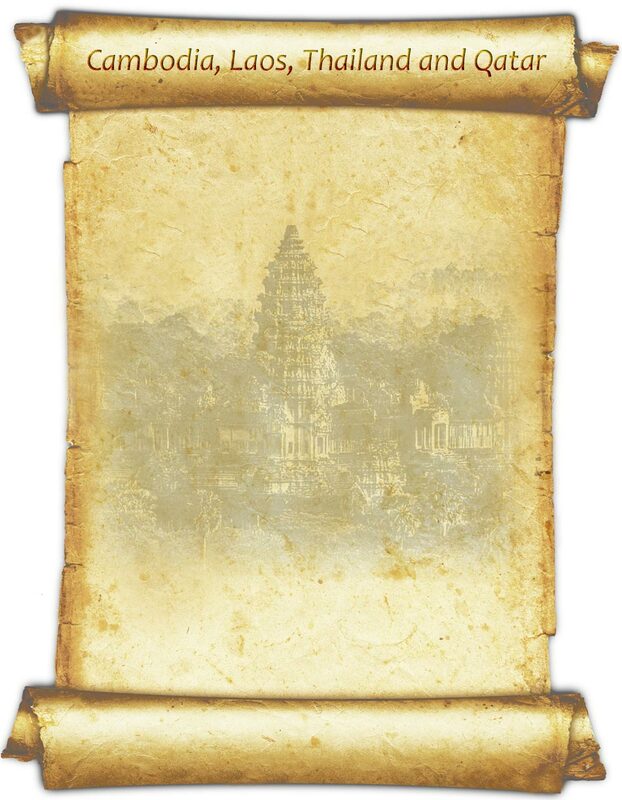 I must say that my visit to the whole Angkor area was a memorable one but I had enjoyed the many different aspects of Cambodia and found the people extremely friendly. I flew back to Bangkok the following day and found Don Muang Airport less intense than it had been a few days earlier. Immigration, though, took time but once through, I was quickly on my way. I put up in the Don Muang Hotel which was just about within walking distance from the airport after following some directions given by the hotel's website without which I wouldn't have had a hope. The hotel is set over three buildings and the rooms are very comfortable. 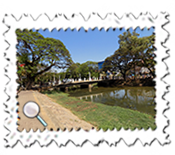 The last leg of my trip took me to Vientiane, the capital of Laos. Something had taken my imagination about Laos and I felt it might be the highlight of the trip. Cambodia had been excellent and Laos was every bit as interesting. After a further Air Asia flight, I suspect that many of us learnt a few tips on how to have a comfortable visit in Laos. Like Cambodia, US dollars were very much an accepted currency but the notes had to be in very good condition. I had paid US$36 for my visa on arrival and had proffered a US$100 note. The change given was a problem as some of the notes were rejected for the bus and hotel, the slightest crease and faint ink stain meaning a polite refusal. Admittedly, the next day I changed the best $20 note I had into Laos Kip - many thousands to the dollar and even more to the pound! - without so much as a bat of an eyelid from the exchange office's cashier. I stayed in the Central Vienna Hostel which had been refurbished. The staff were friendly although the ground floor ceiling was very low and the room slightly dark. The size of the room was fine and its location was very convenient. The French connection is quite noticeable in Vientiane with their road names and not just the outstanding Patuxay Monument, similar in style to Paris's Arc de Triomphe. I walked there both in the afternoon, evening (when the lights made it even more memorable) and went to the top the following morning. My one full day in Vientiane was fun. After the short trip up the Patuxay, I took a bus to Pha That Luang, one of Vientiane's main highlights. 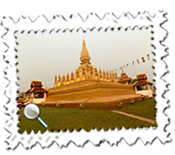 This gold-covered stupa is the main attraction in a very interesting complex which includes a reclining Buddha and further temple. There is an entrance fee for visiting the stupa but everywhere else was free to roam about. 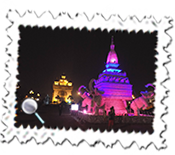 It is a big area not dissimilar to Phnom Penh and was tremendous. 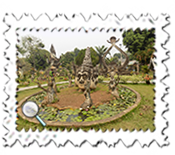 One of the other reasons for visiting Vientiane was its extraordinary Buddha Park, some 25 kilometres out of the city but which can be reached by frequent buses from the capital. I imagine that most people cope with it better than I did: I took the correct bus but heard someone mention Buddha Park so got off only to find that I was at the Friendship Bridge between Laos and Thailand. Boarding another bus after a wait, I found myself going back to Vientiane and had to be dropped off on the main road after much help from locals including a Buddhist monk. I was lucky to flag down a correct bus and eventually reach this curiosity which must rank as one of the most bizarre places I have visited anywhere. 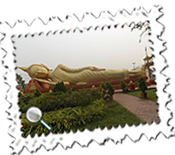 The park is a decent size and there is ample space to move around the sedentary, standing and reclining Buddha statues. One can even go to the top of a rock whose entrance is a somewhat alarming face hewn from the rock. It was worthwhile for looking down on the statues rather than just seeing them from ground level. 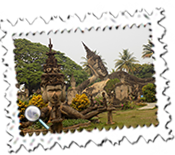 This place is an absolute must and I returned to Vientiane delighted and, after my earlier travails, relieved to have visited it. There is also a night market in Vientiane which I visited later that evening. Set by the Mekong River, the atmosphere was lively and fun. Before leaving the following day, I did some shopping in local stalls. Everything in Vientiane was very reasonably priced and £4 bought - without haggling: even I felt too ashamed - a big floppy hat for me and a large bag for my mother. I think it fair to say that everyone was subsequently pleased with the purchases. 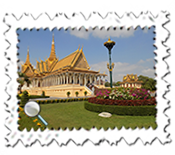 Rather than taking a not completely convenient flight from Siem Reap to Vientiane, I had decided to book indirect flights via Bangkok. 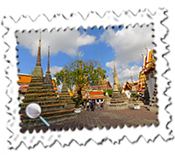 It did strike me immediately afterwards whether I could keep transiting through Bangkok but communications to the Embassy assured me that three (which I had) was fine within a six-month period. So it proved but it does likely mean that I cannot do it again until the end of the year. After another pleasant stay in the Don Muang Hotel, I took the free transfer bus to Suvarnabhumi Airport for my return flight to Gatwick via Doha. 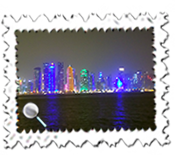 I went for the long transit so that I could take the Qatar Airways City Tour which went well. First of all, Qatar Airways again confirmed legroom seats on both flights which was again was a bonus. The flight to Doha was again comfortable and on time and although I initially made a bit of a hash of finding the meeting place for the tour, it worked out without any subsequent drama. 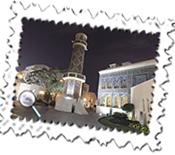 The two-and-three-quarter hour tour was an excellent introduction to seeing Qatar's capital. The longest stop was unsurprisingly at a souq but whilst stops in other areas were shorter, it was a good way of seeing what the city has to offer for a longer visit in the future. It was nice seeing the bright lights of the main area from the opposite side of the water. It reminded in its general style of Dubai and I was very pleased to see a tiny bit of it between flights and, whilst I returned exhausted after travelling for almost a full day, it was highly worthwhile.